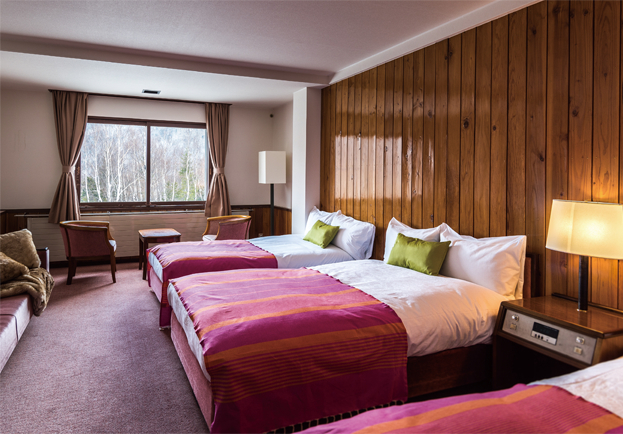 Up to four guests can be accommodated here in the most spacious room in the hotel. It has two single beds and two sofa beds, making it just right for families or couples. Peacefully relax in this modern space with columns and walls decorated with wood. 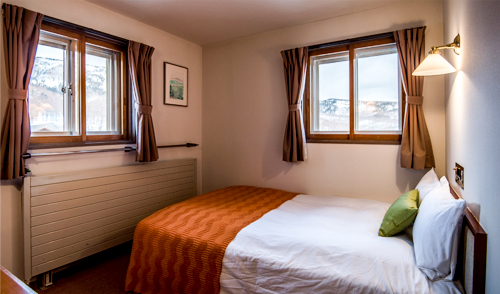 With three beds and a sofa bed, up to four guests can be accommodated in this spacious room. View the majestic figure of snow-covered Shiga Kogen from the window and enjoy a relaxing time with family and close friends. Take in the view of the beautiful Yakebitai Mountain in this room featuring an arched ceiling that gives a spacious feel. Couples in particular can relax in a cozy atmosphere where white walls and beautiful wood tone complement each other. 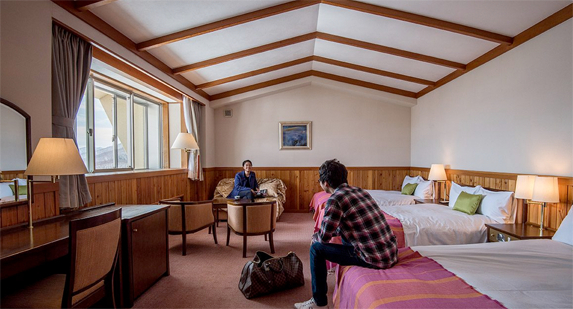 This spacious room comes with three beds; and with the addition of a sofa bed, it can accommodate four guests. Beautiful Shiga Kogen covered in snow can be viewed from the window. The feel of natural wood paneling covering an entire wall envelops the room in a soft atmosphere. 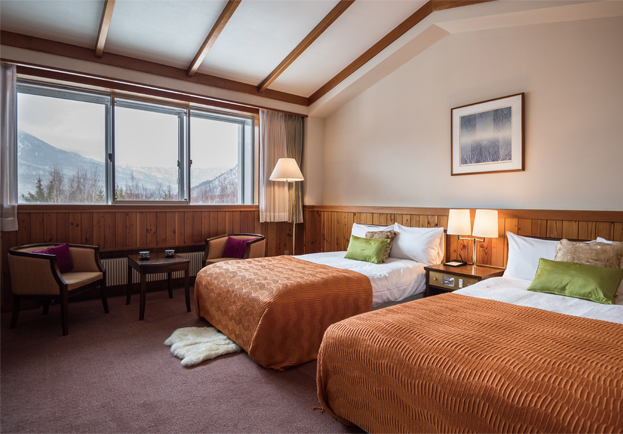 This room features a wide window that provides a grand view of the beautiful mountains of Shiga Kogen. Expressive wood completely covers the wall, allowing one to feel the warmth of nature even while indoors. With two beds and a sofa bed, two to three guests can stay in comfort. This room allows you to stay with your dog, a precious part of your family. With two beds and a sofa bed, two to three guests can stay in comfort. Amenities are also provided for your dog. 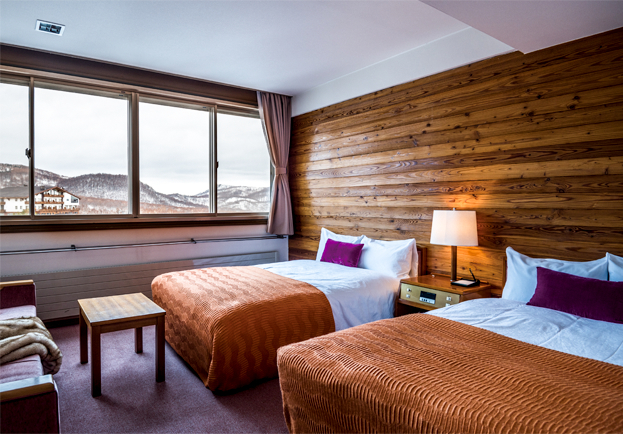 Open the curtain to reveal the magnificent scenery of Shiga Kogen at your window. This simple room with a relaxed atmosphere has two beds. 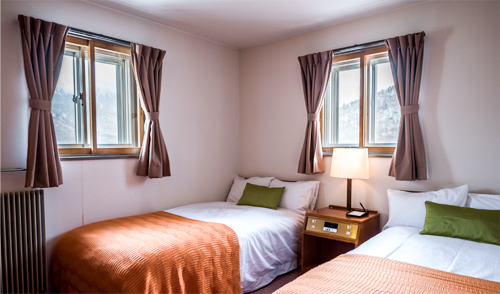 Windows in two locations let you view the beautiful scenery of Yakebitai Mountain covered in snow. And abundant amenities help you stay in relaxed comfort. 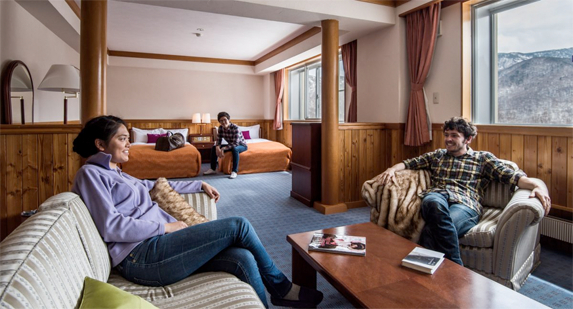 This room is recommended for those who want time alone to enjoy the beautiful nature of Okushiga Kogen. It features a roomy 140 cm wide bed where you spend time in quietness without being hurried. A grand view of Shiga Kogen can be seen out the windows. * Actual living space may vary from fine code measurements upon construction.